Lights. Camera. Action. This vibrant metropolis is the home of Bollywood, but it would be a mistake to assume that it is its only attraction. I lived here for 6 weeks in 2007. The length of time and the freedom I had to wander meant I came across a number of unforgettable places and experiences that didn’t show up in the tour guide. There was the Jewish Synagogue taken care of by a barefooted Rabbi, the Anand Chaturdashi festival (in which Hindus flock to the beach to submerge Ganesh statues in the ocean) and the Dahi Handi festival (in which Hindus create a massive human pyramid to break a hanging clay pot). These incredible experiences highlighted the character, diversity and spiritual commitment of the city’s inhabitants. Pro Tip: September is a good time to visit – it is post-monsoon and you can try to catch the very visual and inclusive Anand Chaturdashi and Dahi Handi festivals. Unfortunately, I can not give as thorough a review of this city re: this trip as I have the others. We were in Mumbai for one purpose only – a wedding reception for my In-Law’s closest friends and family. 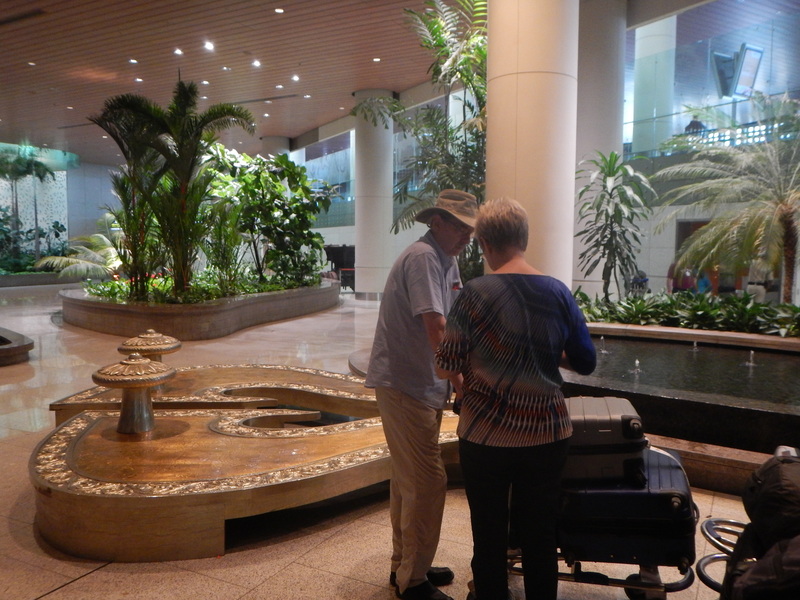 We landed in the afternoon, had the reception that night and left for Bangalore in the morning. However, the story is worth telling as a glimpse into a few cultural differences. So here goes. First of all, the Mumbai International Airport is gorgeous. The terminal we landed in was an airport/art museum hybrid with much care, attention and space given to design elements. An hour long ride away from the heart of the city brought us to Thane, a city considered part of the Mumbai Metropolitan Region. Immediately, you can tell the difference from the North. 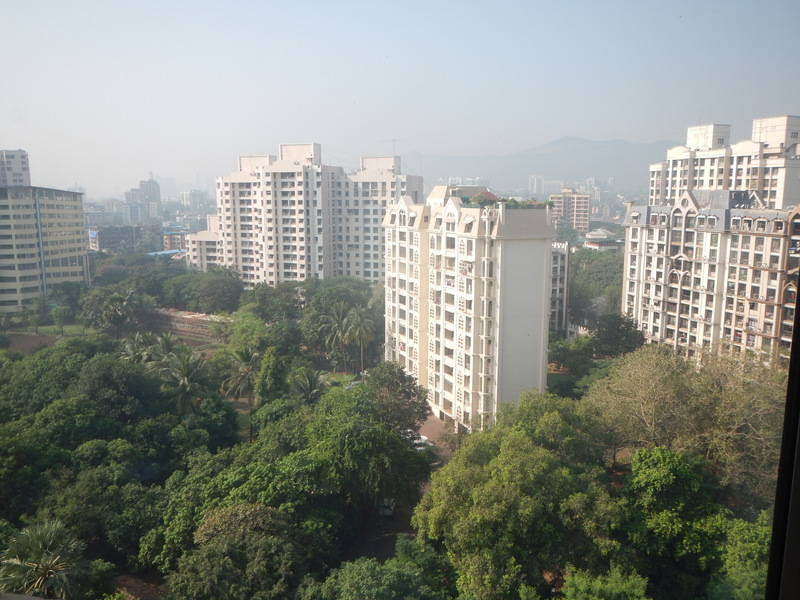 It is lush, green and waterlogged with dark stains indicating the flow of water on the city’s forest of high rise apartments. We chose this luxury hotel so we could hold a larger event, as well as be close to family. This hotel is not in the heart of the city, so make sure to Google! The rooms were large and clean. The hotel has an impressive feel, but Trip Advisor reviews complain about service. From the 20 minutes it took for us to get some tea when we arrived, I’ll believe them. Weddings and family are extremely important in Indian culture, therefore a reception for the family that wasn’t able to make it to America for the wedding is a requirement (a very fun requirement). When I arrived, we discovered that the gold jewelry had not made its way from New Delhi to Mumbai. I was very go-with-the-flow, but for my MIL this was a 5 alarm fire. My mom, MIL and one very early guest grabbed our driver and were dropped of at the local mall. 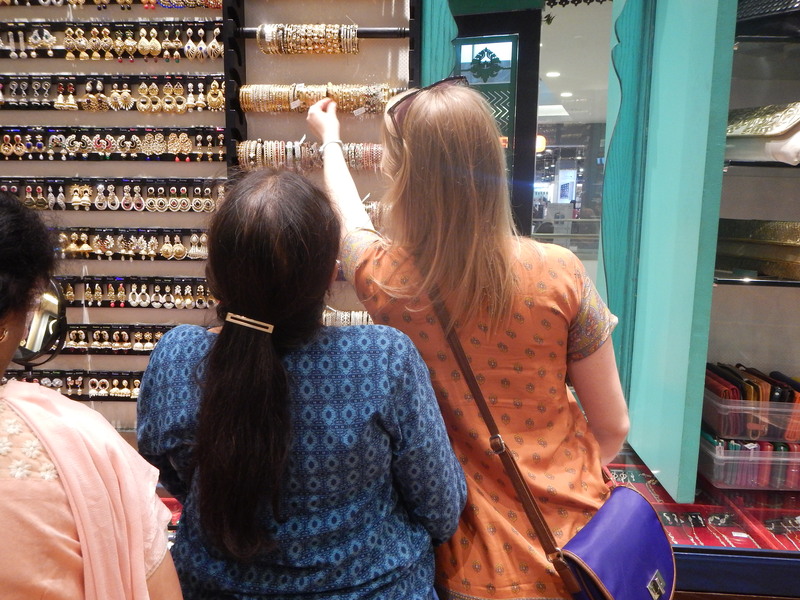 I could have spent days in the mall with a mixture of Indian and European stores; but we had a mission – necklace, bangles and clip earrings, the latter being the ultimate challenge. Rushing, running, buying and we were back out front… with no driver in sight. Time was ticking, and I had 30 minutes to get ready. We ditched the driver who wasn’t answering his phone and the 4 of us adult women squeezed into a rickshaw. Sitting on her lap, I made friends very quickly with our guest. Back at the hotel, I changed into my lengha with impressive speed (if I may say so myself). The next morning we were up and out… on our way to Bangalore! I love your dance moves! You managed it so well, wearing that outfit and dancing to Chaiya-2. I think you are quite comfortable with the Indian culture by now. Great video!